• Es gibt 238 Zimmer und 65 Suiten. • Conferenz Aktivitaeten fuer bis zu 600 Personen, Hallenbad. der München Oper und Theatinerstrasse. Das Hotel liegt direkt gegenüber den Boutiquen von Chanel und Cartier. 15 minuten Spaziergang zum Haus der Kunst und zum Englischen Garten. • 1848: Maximilian II (1811-1864) becomes King of Bavaria after the abdication of his father King Ludwig I of Bavaria (1786-1868). Maximilian II had the desire to create an elegant avenue in Munich near his Royal Residence. Made in the Neo Gothic style, measurig 23 m wide and 1,164 m long, the avenue is named after him, « Maximilian »strasse. The King was the father of King Louis II of Bavaria and an uncle of Sissi (Empress of Austria) and her sister Helene (Princess of Thurn & Taxis), they later return to the hotel. • 1852: The German architect Rudolf Gottgetreu drew various designs for the future Maximilianstrasse. • 1853: Beginning of the construction of Maximilianstrasse. The still living father of King Maximilian II, the former King Ludwig I (erected Ludwigstrasse was a friend of the dancer Lola Montez) is not very enchanted by the project. Visiting the street during it’s construction he was supposed to have left the comment « Pfui Teufi » which is a Bavarian expression for « hideous ». • 1854: Difficulties in the construction of the Vierjahreszeiten building. The initial plan was to make it become a sales and administrative building for the Munich textilproducer Anton Röckenschuss. There is not enough money to finish the construction which is interrupted when the first floor was erected. 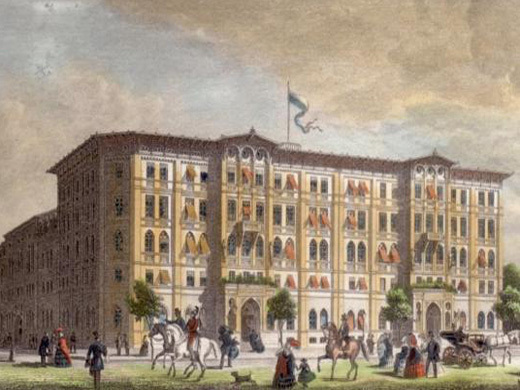 • 1855: King Maximilian II brings the Munich wine merchant August Schimon (1806-1866) on as an investor and convinces him to open a « Grand Hotel ». Schimon was originally from Hungary and owned four florishing liquor stores. • 1858 July 25: Opening of the Hotel as « Hotel zu den Vier Jahreszeiten ». The Vierjahreszeiten is immediately a sensation all over southern Germany. The Hotel includes a stable for 60 horses, so that hotel guests can « park » their horses. It also includes a manual elevator and 6 marble bathrooms equipped with « Dittmann’s Wellenbadschaukel », a kind of « rocking bathtube ». The hotel is very convenient for the King of Bavaria, as he has a place near the Royal Residence where his guests can be accommodated. • 1859 August: The Vierjahreszeiten is damaged by a fire. The citizens of Munich feel very concerned and make a collection to help the hotel - at the end there was more money collected than necessary for the renovation. November 10: renovation is completed very quickly and the hotel is ready to host a gala diner at the occasion of the 100th birthday of the poet Fiedrich Schiller. • 1860: From time to time 3 smashing looking and very artistic friends rush through the Vierjahreszeiten Lobby, Elisabeth in Bayern (1837-1898), her young cousin Ludwig von Bayern (1845-1886) living nearby at the Royal Residence and their mysterious friend Paul von Thurn & Taxis (1843-1879). Whenever they pass by all three of them captivate the attention of the people sitting in the lobby. Each of them is a little introverted and extremely glamorous. Each of them will enter history in a different way. • 1864: Young Ludwig von Bayern becomes King Ludwig II of Bavaria after the death of his father King Maximilan II. Even though the King is not ready for his high functions, his youth and good looks made him very popular. As a King Ludwig II is not so much in Munich - he is fascinated by the construction of his fairytale castles. Among them Herrenchiemsee, Linderhof and the world famous Neuschwanstein (which is today part of the Walt Disney logo) built between 1869 and 1886. Ludwig II sees himself as a « Moon King » in reference to the « Sun King » Louis XIV whom he admired. • 1866: The Austro Prussian war creates a recession and Bavaria loses much it’s independance forced into an alliance with Prussia. 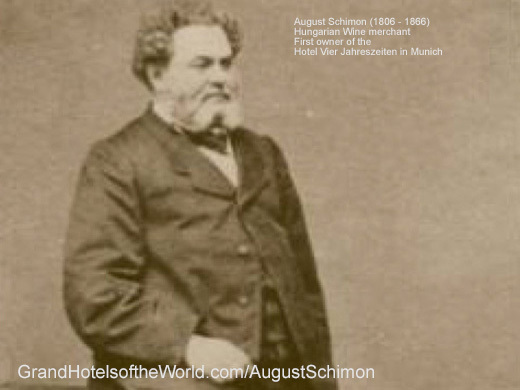 The hotel owner August Schimon was heavily engaged in different real estate projects along the Maximilianstrasse. He is beleived to have comitted suicide after encountering difficulties to face interest payments. After his death his family stays very united (7 children and his widow Josepha Göttler), friends help and they manage to keep both the hotel and the wine business. His sons Max und Ferdinand Schimon take over the wine stores and his stepson Johann Samuel Obermayer the hotel management. • 1874: Inauguration of the completed Maximilianstrasse, built in a very unique and uniform style mixing rennaissance and new gothic elements. The street is inaugurated under King Ludwig II. • 1875 (circa): Elisabeth in Bayern, in the meantime Sissi, Empress of Austria stays in the Hotel for several weeks. She likes the rocking bathtubs so much that she caused a major flood of water going to the lower floors. After her departure the rooms below her suite need to be renovated and the « rocking bathtubs » are removed. • 1885: Hotel Vierjahreszeiten becomes an Aktiengesellschaft (corporation), the Schimon/Obermayer family keeps most of the shares. • 1886: King Ludwig II was deposed and died mysteriously a day later. Luitpold von Bayern (1821-1912), uncle of Ludwig II becomes Prince Regent of Bavaria. • 1889: Another sensation arrives at the Hotel, Electricity (perfected by Thomas Edison in 1879), 1,000 light bulbs are used to illuminate the Hotel (at a time when the entire city of Munich disposes of 4,000 light bulbs). Johan Samuel Obermayer dies Adolf Obermayer (son of Johan Samuel Obermayer, grandson of August Schimon) becomes the new director at age 21. • 1890: Adolf Obermayer equips most Vierjahreszeiten rooms with another invention Alexander Bell had made in 1876, the telephone. • 1905 (circa): Renovation of the Hotel, the entrance on Maximilianstrasse is enlarged Construction of the Jugendstiehl Cupola with glass ornaments representing the Four Seasons. The Hotel Vierjahreszeiten is the social center of Munich and it is considered as one of « the Grand Hotels » in Europe. • 1910: The King of Siam (Thailand) arrives with 1,320 suitcases. The stay at the Hotel must have had an effect because – some generations later - the Royal Family of Thailand decided to buy the Hotel Vierjahreszeiten, including it’s owner the entire Kempinski hotel chain. (see also History of the Kempinski hotel chain below). • 1913: Karl Rapp founds a company, called Rapp Motorenwerke which would later bring many clients to the hotel. The company has a significant role in the attactivity of Munich but is better known under it’s present name BMW. • 1914: The heir to the throne of Austria, Archduke Franz Ferdinand and his wife Sophie von Hohenberg stay at the Hotel. Shortly later on June 28 they are assasinated in Sarajevo, beginning of the first World War. • 1918: End of the Monarchy, abdication of the last King of Bavaria, Ludwig III (1845-1921 – son the Prinzregent Luitpold). November 8: Proclamation of the Freistaat Bayern. The war and the following turbulent times badly affect the hotel which started to lose money. Also there are no more royal state guests, once an important part of the clientele. • 1921: A Munich bank, Joseph Olbrich, main creditor of the hotel forclosed on the property from the shareholders (mainly the Schimon/Obermayer family). • 1924: The State Bank of Bavaria becomes the new owner as losses continue. The Vier Jahreszeiten is handed over to the city of Munich. Among the city council heavy discussions arise whether the hotel should be closed. 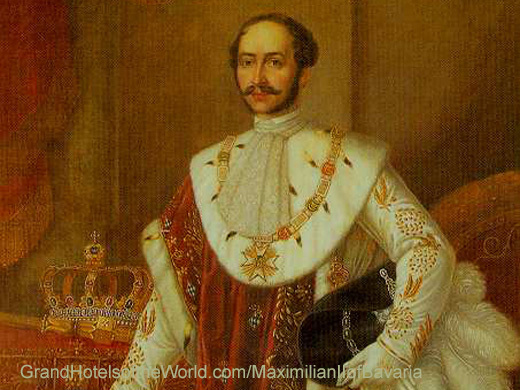 Karl Scharnagl, the major of Munich fights for the famous hotel as he sees it as a major attraction for the city. 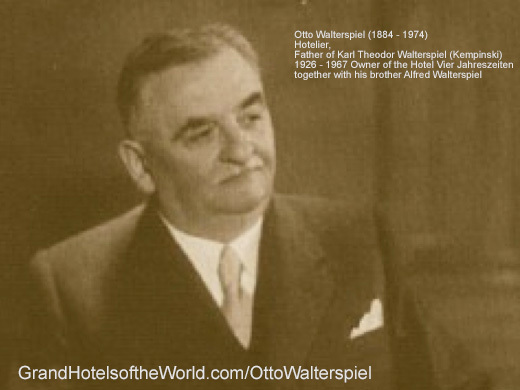 • 1926: The brothers Alfred (1881-1960) and Otto (1884-1974) Walterspiel buy the hotel. Alfred is a famous cook, Otto a businessman. In 1910 they had acquired the Hiller Restaurant in Berlin from Lorenz Adlon (founder of the Hotel Adlon), which they turned into a succes, but after the end of the reign of the monarchy, their restaurant has no more clients. The Walterspiel moved to Munich where they opened the fashionable Walterspiel Restaurant (initially located on Fürstenstrasse). 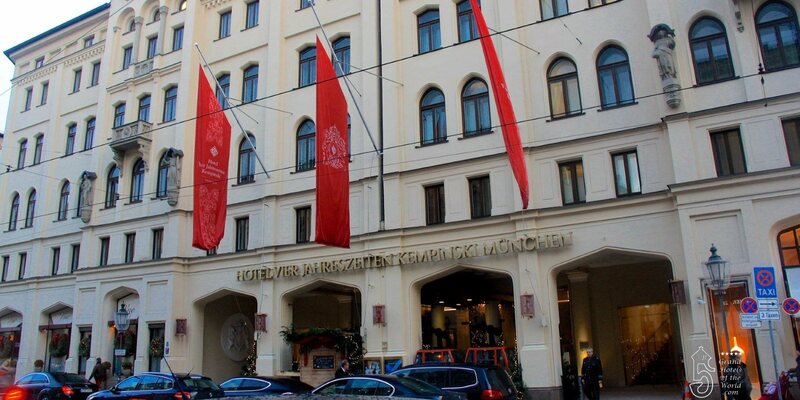 The city of Munich was content to find them as a buyer of the struggeling Hotel. 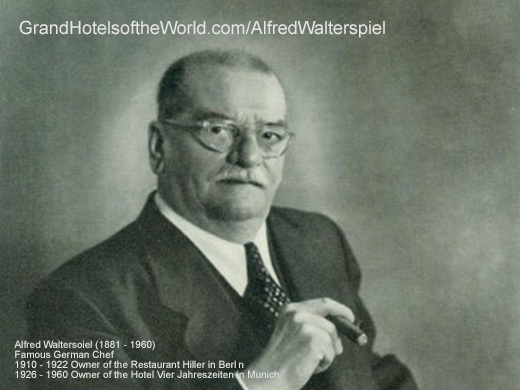 • 1927: The Walterspiel brothers renovate the Hotel and soon they were organizing one spectacular event after another, again the Hotel is in the public eye, a big success in the world of Palace Hotels. The Walterspiel brothers were living on the 5th floor of the north western backside of the Hotel. • 1929: Black Tuesday affects most of the World’s Palace and Grand Hotels. Business become difficult again and recovers a few years later. • 1933 – 1938: During the peak season, like Oktoberfest, the Walterspiel children and their nanny move out of the Hotel, so that their rooms can be used for Hotel guests. • 1939 September 1: Start of World War II. • 1942 November 9: The first bombs fall on Munich. The Walterspiel family moves to Krailling and Harlaching near Munich while the Hotel remains open. • 1944 March: Most of the Hotel is destroyed by an Allied bombing run. Only the part going to Maximilianstrasse remains half intact. • 1945 May 1: The US Army requisions the hotel. May 8 end of World War II. • 1947: Special permission is given to the Walerspiel brothers to rebuild the Vierjahreszeiten. This is two years after Hermann and Falk Volkhardt were allowed to reopen a restaurant at their Hotel Bayerischer Hof. 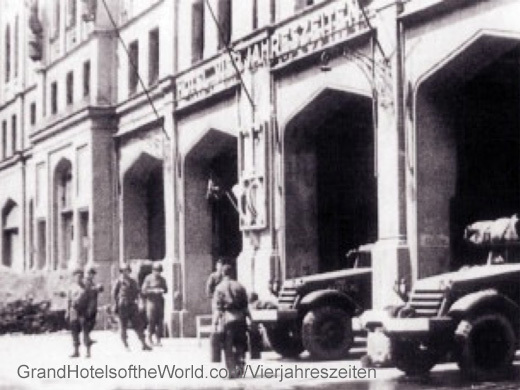 • 1948 April: reopening of the Hotel as an « Export Hotel » in the « American Zone of Occupation in Germany » The Walterspiel brothers, already in their sixties, succed in relaunching the hotel which again becomes a status symbol of post-war Germany. For a while Hotel Vier Jahreszeiten was called in Munich « Haus der Dollar Gäste » (hotel for people with US Dollars). • 1950: The hotel is afain accessible to all travellers. Reopening of the Walterspiel Restaurant which soon became one of the first restaurants in the young Federal Republic of Germany (BRD) to be awarded a Michelin star. Here and there one of the Walterspiel brothers accomanies leaving guests to their car. • 1955 March 6: The Shah of Iran and Queen Soraya arrive at the Vierjahreszeiten where they stay for a week and occupy an entire floor. Thousands of people wait outside the hotel upon their arrival. • 1956: Georg and Klaus Walterspiel, sons of Alfred Walterspiel enter the Management of the Vier Jahreszeiten. Otto II Walterspiel, son of Otto Walterspiel works in the chemical Industry (later President of Kali & Salz), Karl Theodor Walterspiel, the younger son of Otto Walterspiel starts an independent hotel career which begins at the Dorchester in London, (see also year 1968). • 1960: Death of Alfred Waterspiel. • 1961 / 1963: Soraya, the former Queen of Iran and one of the most photographed women of that time was a frequent guest of the Vierjahreszeiten. Devastated by the divorce from her still loved husband, Mohammed Reza, the Shah of Iran for « raison d’etat » (she could not have children – an heir to the throne) she had difficulties to find a new sens to her life. She often went to the looby watching the « four seasons » emblem in the cupola while daydreaming about her previous state visit to Munich in March 1958. She also liked to observe people walking through the lobby. Most of the times she was accompagnied by her mother Eva. Sometimes she was also sitting there with her friend Johannes von Thurn & Taxis who cheered her up with endless stories that happened a century earlier to his great uncle Paul von Thurn & Taxis and his great aunt Empress Sissi, some of them taking place in the same spot, the famous Vierjahreszeiten Hotel Lobby. Princess Soraya lived in Munich for a while, her house, Opitzstrasse 6 was off Pienzenauerstrasse in Bogenhausen on the other side of the Isar river, a good hour walking distance from the hotel. Sometimes she liked to walk along the Isar river from Bogenhausen to Maximilianstrasse 17. (see also year 1958 and 2000). • 1967: With the decision to host the Olympic games in Munich new investments in the hotel infrastructure seam inevitable, a swimming pool and an underground car park is needed. Some of the Walterspiel heirs decide to sell. 3 investors arrive, a management contract is prepared with the still small Berlin and Hamburg based Kempinski Hotel Group. Among the Kempinski managers is Karl Theodor Walterspiel, director of the director of the Kempinski Hotel Atlantic in Hamburg. Karl Theodor Walterpiel (1933-2000) knew the hotel well, he grew up there as one of the children of the hotel co-founder Otto Walterspiel. • 1968: Elizabeth Taylor stays at the Vier Jahreszeiten. According to Bob Colacello, an American writer and Vanity Fair contributor, she was « heavy maintainance » for every hotel she went. • 1969: Rudolph Moshammer, a rather eccentric Bavarian fashion designer opens his Boutique « Carneval de Venise » opposite the Vierjahreszeiten. The Boutique, even though (in the eyes of some) rather ridicolous, helps to add more fame to the Maximilianstrasse. Over the years his miniature yorkshire Daisy, a frequent visitor of the Vierjahreszeiten Lobby, became one of Germany’s best known dogs making it up to the cover of « Bild« . • 1970: Kempinski Hotels buys more shares of the Hotel. • 1972: The Summer Olympic games are hosted in Munich, the Olympic Committee stays at the Hotel. • 1974: Death of Otto Walterspiel. • 1978 November 6: Franz Josef Strauss (1915-1988) becomes Minister President of the German State Bavaria. He was a fiercy rival of the later Chancelor Helmut Kohl and both one of Germany’s most both liked and most disliked politician. He was a frequent visitor of the Vierjaherszeiten where he had many meetings - the Munich Airport is named after him. • 1982 July: The German American couple Honoré and Karl Wamsler celebrate their Silver Wedding at Schloss Schleissheim. The hotel is invaded by American and International high society. The guest list done with the help of Caroline Wamsler and Clemens von Steding resulted in the most significant social event in the Munich of the 1980es. • 1986-1990: The Brazilian Beauty Aimée de Heeren(1903-2006) is a regular guest at the hotel at least once a year early December. In the 1930s she was the « secret » First Lady of her country and later the gitlfriend of John F Kennedy's older brother Joseph. She was considered as one the world’s most beautiful woman. Already in her late 80es, she was still so beautiful the entire Hotel Lobby was speachless whenever she walked through it, with or without her breathtaking jewels. On one trip she was accompanied by Honeychild Hohenlohe, another guest, and friend of « every » major Palace of Grand Hotel Director in Europe and the US … Honeychild left the hotel completely « forgetting » to pay the bill. The concierge was running behind the taxi, and what about the hotel bill of the Princess ? The editor of this website happened to hear this story the next day. • 1990: Kempinski buys more shares of the Hotel which is not only Kempinski managed, but also one of the few Kempinski owned hotels. • 2000: The former fan of the Vierjahreszeiten lobby, Princess Soraya lived in Paris where she took Internet lessons at the Cremerie de Paris, once the first Internet Cafe in Paris. The Princess was sometimes a little lonely and the internet lessons distracted her, almost every thursday afternoon she came to the cafe located at 15 rue des Halles. From time to time part of the lessons was looking at websites of the hotels she had been to, among them the two Hotel Vierjahreszeiten, the one in Munich and the one in Hamburg. Due to her uncountable stories these lessons were more than fascinating – walking through history with a true witness. Coffee with Winston Churchill, a glass of wine with Konrad Adenauer, a gin tonic with Drought Eisenhauer. Soraya’s hotel anecdotes resulted in the later creation of « Grand Hotels of the World.com« , edited from the Cremerie de Paris by her former Internet teacher. Most of Queen Soraya’s favorite Hotels are listed. Too bad the editor of the website did not take more notes, but little by little the stories come back to his mind. I give a tip the moment I arrive never when I leave. … and waybe from time to time you will think about your most untalented internet student ». A few days later, October 26, she had died. less than 50 French Francs, the price of a « café, maybe a cafe crème in the lobby of a Grand Hotel ». : « Grand Hotels of the World.com », « Palace Hotels of the World.com » , « Hotel Vier Jahreszeiten.com » and a multitude of other generic and super iconic Hotel expressions were registered with her present. And in terms of « domain shopping power » 500 French Francs (152,45 euro) was a significant amount of money. • 2006: Stephan Kaminski becomes the new director of the Hotel. He started his Hotel career at the Vier Jahreszeiten as a bellhop, before working at many different hotels around the world and finally returning to the Vierjahreszeiten. • 2007: Renovation of the Hotel for 42 million euros. The Hotel is renovated with taste, but it loses one of it’s historic attractions: the Hairdresser Honsell, which has always been part of the Hotel legend. Once the Walterspiels were gone, the hairdresser Honsell was still there and this in the 4th generation, still receiving today the descendants of the Kings of Bavaria and generations of chic Vierjahreszeiten clients. The salon was replaced by more convention space. Luckily, the famous salon, found a new location two minutes walking distance away, Wurzerstrasse 10. • 2010: Axel Ludwig from Bonn becames the youngest General Managers in the history of the Vierjahreszeiten. • 2013 June: Five Star Diamant Award given to the Vier Jahreszeiten. • 2013 July: Inauguration party with 750 guests for the new interconnectable Vierjahreszeiten Ballroom « Maximilian I, II and III ». • Today: The Lobby of the Vierjahreszeiten remains a glamorous hangout mixing chic International guests, some « etwas spiessige Vorstände » (some CEOs that look a little tacky), a little bit of « Munich Schickeria » (mildly excentric high societey debutants) and some very elegant people from Bavaria. The peak of glamour is when a gala is about to take place in the evening and the guests arrive dressed in haute couture and notable jewellery. Or when the beautiful Princess Ilka zur Lippe, Munich’s best connected property adviser, appears in the lobby for a drink with her long red hair and some of her extravagant clients. 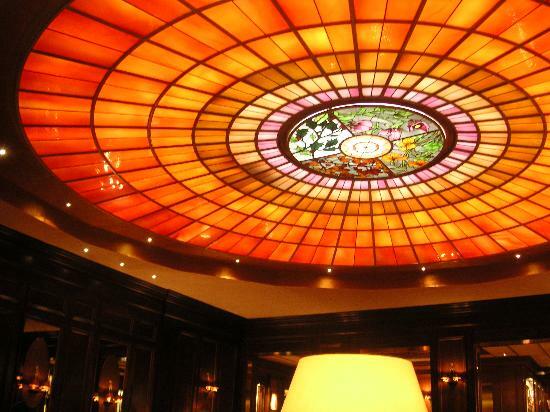 The Lobby which is located below Adolf Obermayer’s beautiful colorful glass cupola representing the « four seasons », is still referred to as « Münchens schönstes Wohnzimmer » (the most beautiful living room in Munich). • Ownership: Kempinski (owned by Crown Property bureau, the Monarchy of Thailand). • General Manager: Axel Ludwig. The list only mentions those Kempinski Hotels, which are historic places and which are listed on Grand Hotels of the World.com.